The United States is in the midst of an era of great competitiveness in presidential contests. 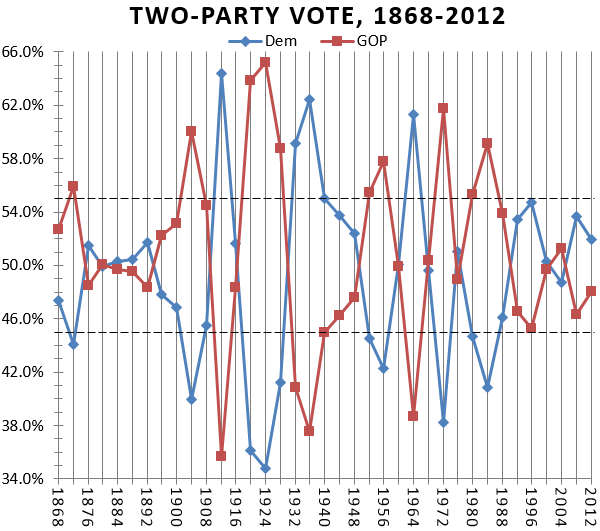 Not once in the last seven presidential elections has a party won more than 55% or less than 45% of the two-party vote. In a recent article for Politico Magazine, the Crystal Ball team argued that fundamentals, recent history, and the nation’s marked political polarization portend a highly competitive 2016 tilt. If the indicators for 2016 play out close to expectations and induce a tight open-seat battle, it may become the eighth consecutive contest where neither major party garners more than 55% of the two-party vote, a new record. The most recent streak began in 1988, when Republican George H.W. Bush won what many consider to be Ronald Reagan’s third term with 53.9% of the two-party vote, defeating Democrat Michael Dukakis. But the elder Bush lost his 1992 reelection bid to Democrat Bill Clinton, who won 53.5% of the two-party vote. That election did feature a complication for the two-party calculation: independent Ross Perot won 18.9% of the total popular vote. But unlike other notable independent or third-party candidates such as states-righters Strom Thurmond or George Wallace in 1948 and 1968, respectively, Perot won zero states and electoral votes. In 1996, Clinton won 54.7% of the two-party vote to win reelection over Bob Dole, the largest two-party take between 1988 and 2012. Four years later, Democrat Al Gore famously lost to Republican George W. Bush despite narrowly edging Bush in the popular vote: Gore won the two-party vote 50.3% to 49.7% but lost the Electoral College. The younger Bush won a majority of the two-party vote (51.2%) when he won reelection in 2004 against Democrat John Kerry. Most recently, Democrat Barack Obama won the two-party vote twice, garnering 53.7% in 2008 and 52.0% in 2012. In the seven presidential elections between 1988 and 2012, the average two-party vote margin was 5.5 percentage points and the median margin was 6.9 points. Remarkably, this septet’s precursor, the 1876 to 1900 period, was even more competitive, with an average margin of 2.7 points and a median margin of 3.0 points. One indicator of the competitiveness and strident geographical political divisions (e.g. the Solid South) of that era was that the popular vote winner lost in the Electoral College twice in 12 years, in 1876 and 1888. In the former instance, Republican Rutherford B. Hayes won the controversial 1876 contest despite losing the national popular vote by three points to Democrat Samuel Tilden. The purported Compromise of 1877 was reached to allow Hayes to hold the presidency in exchange, essentially, for the end of Reconstruction. The 1880 election saw the closest popular vote margin in American presidential history, with Republican James Garfield defeating Democrat Winfield Hancock by 0.1 points in the two-party vote — a margin of just over 9,000 votes. In 1884, Democrat Grover Cleveland defeated Republican James Blaine by 0.6 points, putting a Democrat back in the White House for the first time since James Buchanan occupied the office prior to the Civil War. But although he won the two-party vote again in 1888 (by just 0.9 points), Cleveland lost in the Electoral College to Republican Benjamin Harrison. Cleveland got his revenge four years later when he defeated Harrison in both the popular vote and the Electoral College in a rematch. The last two elections of that period saw Republican William McKinley beat Democrat William Jennings Bryan in both 1896 and 1900. Those two races actually had the largest two-party margin of any of the seven between 1876 and 1900: McKinley won the 1896 election (where Bryan made waves with his famous “Cross of Gold” speech at the Democratic convention) by 4.4 points and then won the 1900 rematch by 6.3 points. The run of close two-party votes ended in 1904, when Republican Theodore Roosevelt, who came to the White House after McKinley was assassinated in 1901, crushed Democrat Alton Parker by 20 points. As mentioned in the Politico Magazine article, there is evidence that we’ve entered the most politically polarized period since the end of Reconstruction. With so much polarization, it’s hard to imagine either party winning a blowout victory, even with a dramatic development like the 2008 financial crisis. That year, Obama only won by seven points even though the economic emergency almost guaranteed a Democratic victory because it came on a Republican’s watch. Barring some sort of incredibly drastic shift in the political status quo, it seems hard to imagine either party winning over 55% of the two-party vote in 2016.